Mueller: "The times when we thought that the world revolves around Wolfsburg are history." BERLIN -- Volkswagen is looking at on-demand mobility services such as smartphone ride hailing to earn a "notable share" of future revenues as the carmaker pushes a strategic shift in the wake of its emissions scandal, CEO Matthias Mueller said. VW, which posted $237.90 billion in revenue last year, on Wednesday signed a cooperation deal with ride-hailing company Gett after announcing a $300 million investment in the firm last week. Cooperation with Gett may lead to business models involving car sharing, limousine rides and taxi services in the fast-growing ride-hailing market -- which in Europe alone may yield 10 billion euros ($11.2 billion) of sales by 2025 and could grow more than 30 percent annually, Mueller said. "In future, our core product will not be just the car," Mueller said. "Our core product, our promise to customers, is mobility." Europe's largest automaker will this month unveil a new business strategy aimed at improving accountability and speeding up model development, with greater investments in electric cars, new technologies and mobility services among the key elements, company sources have said. 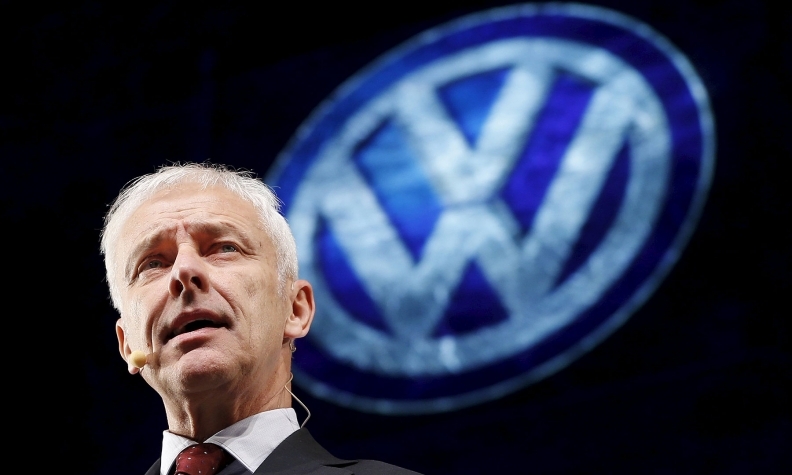 But VW's rivals are not standing idly by. Toyota Motor Corp. last week said it would invest in mobility company Uber, while General Motors invested $500 million in Lyft, Uber's main U.S. rival. The growing number of deals reflects the desire by automakers to avoid becoming bystanders if a significant number of consumers around the world choose to forego vehicle ownership and buy transportation by the mile or the minute. "Through this partnership, we're getting access to 100 million VW customers," Gett founder and CEO Shahar Weiser said. Volkswagen and Gett declined to disclose the financial terms of their agreement. VW has long ignored alternative mobility concepts unlike its German rivals Daimler and BMW who have for years been running their own car-sharing operations. The advent of smartphones has fundamentally changed customer expectations, with travellers seeking to connect to different modes of transportation through apps. Mueller on Wednesday pledged that VW -- following its diesel emissions cheating scandal --will open up to new investments and partnerships such as with Gett. "Volkswagen now is not the same as Volkswagen before I became CEO" in September 2015, Mueller said, indicating the group is willing to expand beyond manufacturing and selling cars as a means to broaden its appeal with customers. He added: "The times when we thought that the world revolves around Wolfsburg are history."